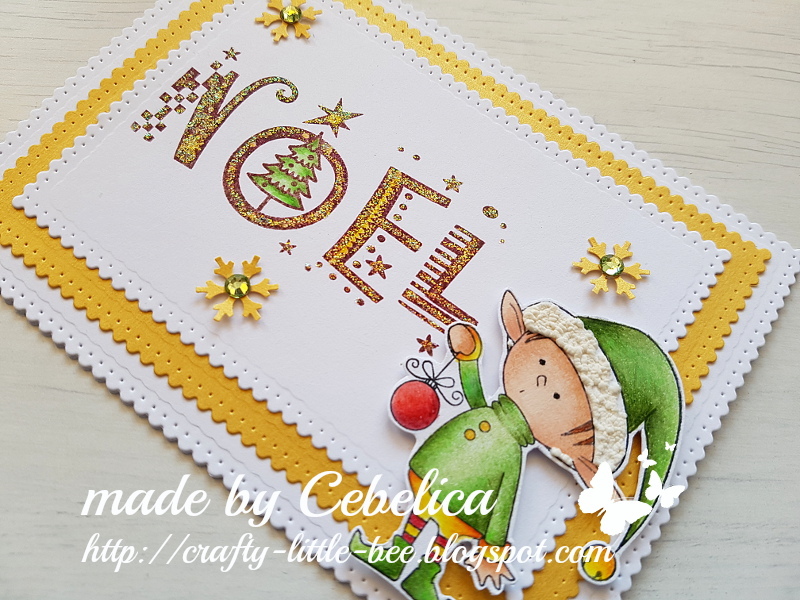 So, today I want to share with you another Christms card I made. This snowman always brings a smile to my face. Isn't it adorable with that little chick on top?! Love it! I did the colouring with pencils. 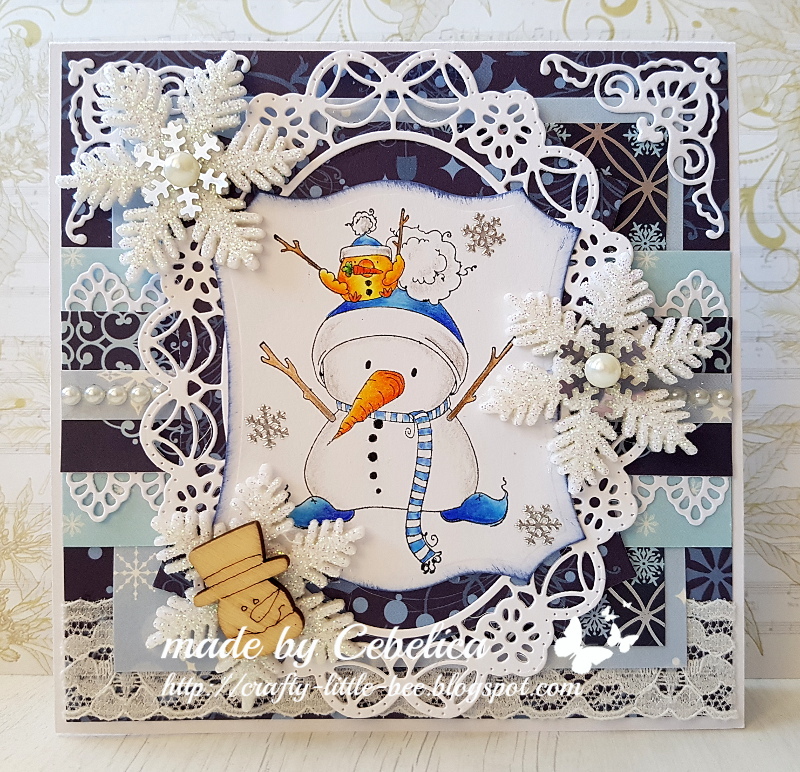 The small silver snowflakes around the image are stickers that I had in my stash. Papers are from DCWV. The big white snowflakes are covered with glitters and are really sparkly in person. I hope you can see this in the photo below. 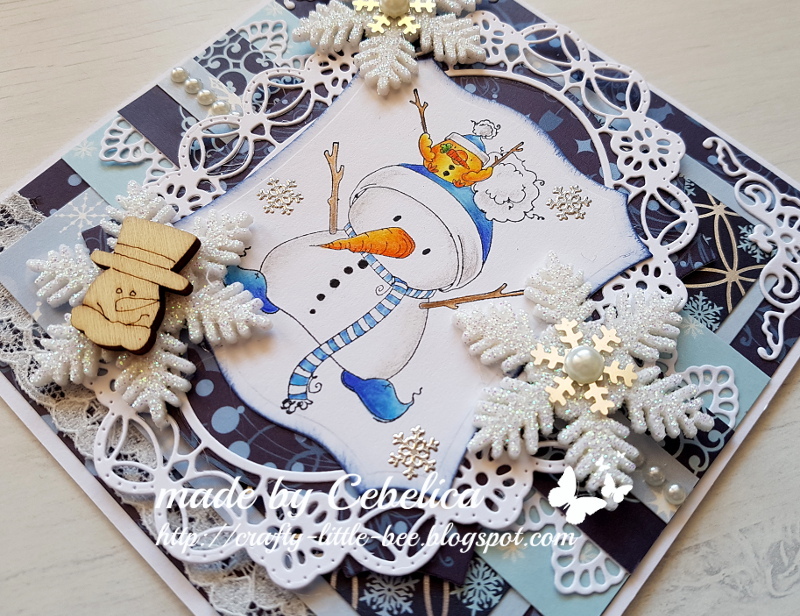 In the center of two big snowflakes I added small silver snowflake sequins and pearl and in the center of the third one I glued a wooden snowman that I had in my stash. I also used some lace and smaller pearls to embellish the card. For a change I didn't do any colouring. 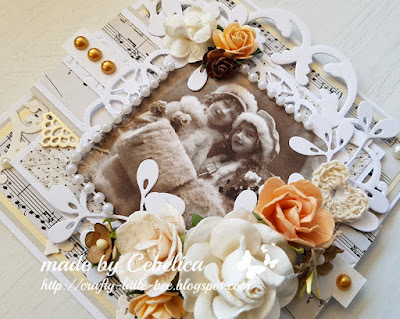 Instead I used this vintage printed image from Pion. Isn't it pretty? 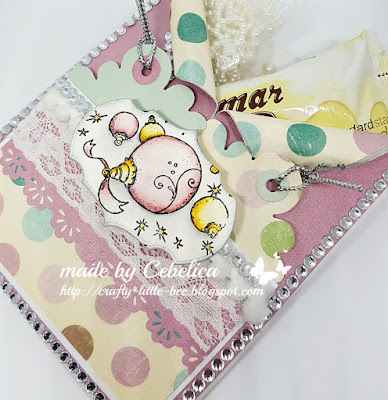 I used different papers from my stash and I embellished the card with some flowers, pearls, pearl string and crochet heart. I hope you'll come play with us. Have a beautiful day! 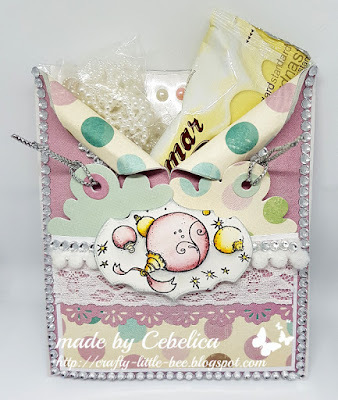 We decided to have a surprise Blog Hop over at Magnolia-licious Challenge Blog and there is a great prize involved, which is Pop Up Box #2, from Farm to Market. This box is full of various stamps, dies and laces. The theme is from Farm to Market from Magnolia Sweden. 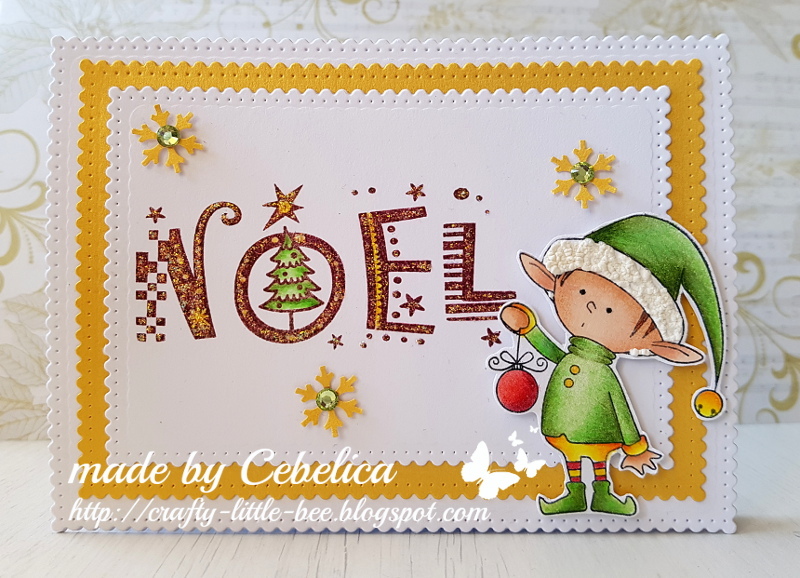 You will need to go to each person to get details of their makes, and collect the 1 red letter on each blog as well as leave a comment. When you have finished looking at them all, Maya is the last stop, collect her 1 red letter and figure out what Christmas word we have scrambled and comment the answer on Maya's post (that's ME). For the hop I created this mini loaded envelope. The tags I put in the pocket are made with Doohickey die. You can find a large selection of doohickey dies in Magnolia-licious store. And here's my envelope "unloaded". The sentiments on the tags are old Stampin' up rub-ons. You should have come here from Rene's blog. 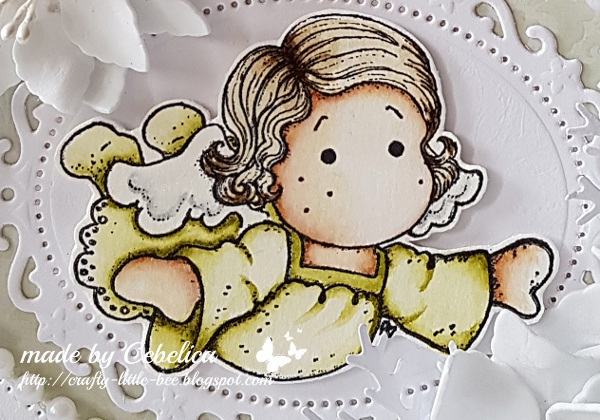 If you are just starting the hop, you are at the last stop, so you better check out all the other posts if you fancy winning a wonderful prize from Magnolia-licious. Remember, to be in for the win of the blog hop, you must leave a comment on each person’s blog, and guess the correct word on THIS post. You have til midnight on Sunday, 17 December, to complete the hop. 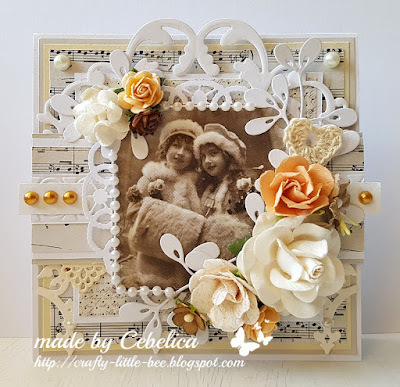 And you can check back on the Magnolia-licious Challenge Blog to see who the winner is on Monday, 18 December. Good Luck to everyone and have fun!! P. S. Comment moderation is ON, so if you don't see your comment don't worry. I see it. ;) I will publish all the comments before the hop ends. Hello everybody! How are you? Are you ready for Christmas? I thought I was, but I figured out I am not quite ready just yet... I have already bought most of my presents, but I am still missing a few bits of this and that. I was going to get them over the weekend, because we were planning to do some Christmas shopping, but then it was raining heavily, so we stayed at home. Maybe we'll go next week - we'll see. For this card I used some pretty papers from Kaisercraft and different laces, pearl string and crystals from my stash as embellishments. I coloured Tilda with distress inks (pads). Flowers (poinsettias) were made with Foamiran. This was the first time I used it and I love it! I can see my new addiction. lol I did fail the first couple of times, but at the end I did get the result I wanted and I am really happy with how my poinsettias look like. :) Besides all the cute Magnolia products you can also get Foamiran at Magnolia-licious store. Do check it out! P. S. You also have a few days left to play with our "bling" challenge at The Sketchy Challenges. Hey there! I'm back with another Christmas card. Once again I kept the design of my card pretty simple. This time I played with adorable penguin stamps from The greeting farm. 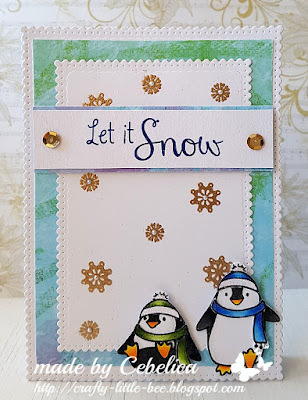 For the background I used white cardstock on which I stamped some snowlakes from the same set as those penguins and embossed them with gold embossing powder. The sentiment is a TGF stamp as well. 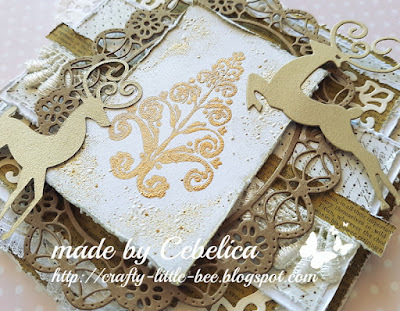 I finished the card with a couple of sequins and tiny pearls. Hey hey! I told you I'd be back soon. ;) I'm so excited to share with you my news... I'm now part of Magnolia-licious design team. Woohoo! I was SO happy when I got the news. Happy, happy, happy! :D Shawn has LOTS of Magnolia goodies in the store, but that's not all, they are also selling Maja design papers (you know how much I love these), Foamiran and other awesome things so it's definitely worth checking the store out. Today is my first card I made as part of this design team. I made it for the challenge that just started at Manolia-licious blog. I hope you will come play with us! 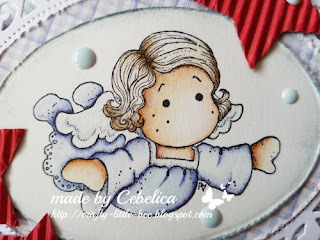 I used one of the older Magnolia stamps. This Flying angel Tilda was one of my first Magnolia stamps and it's still one of my favourites, escpecially for making Christmas card. 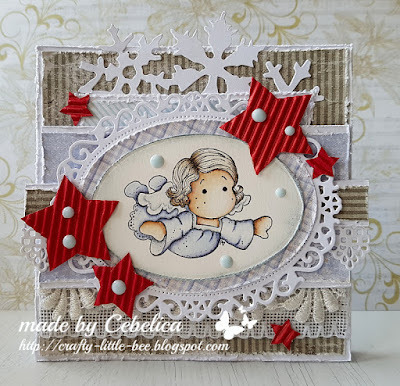 I used gorgeous papers from Maja design that are for sale in Magnolia-licious store and some red "ribbed cardstock" (I'm not sure that's the right name) for the stars. I decorated the card with some lace and homemade enamel dots. 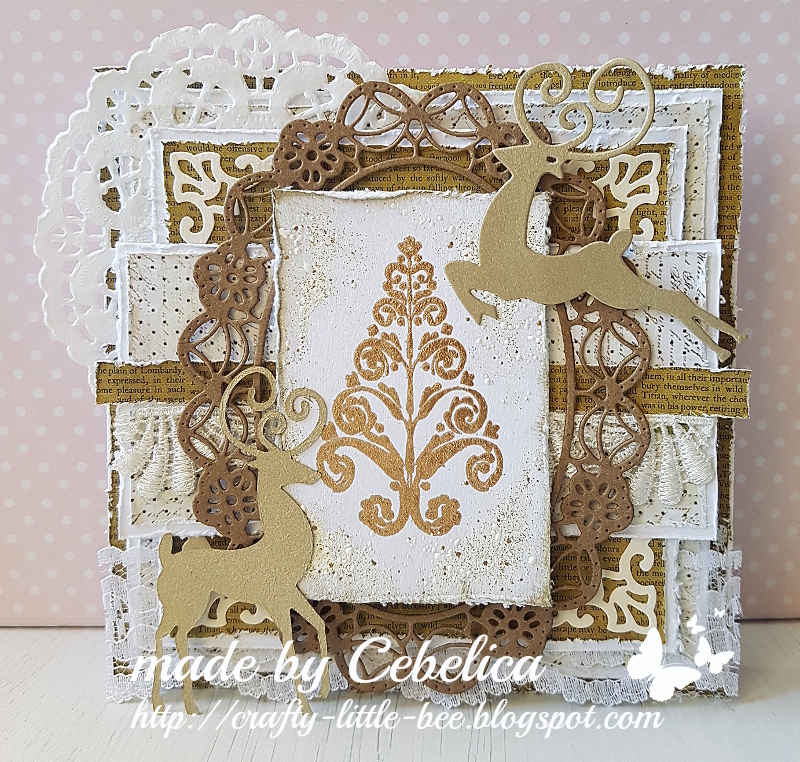 And here's the side view of my card. So, in the spirit od the sparkliest month of the year we have a "Show some bling" challenge for you over The Sketchy Challenges blog. You can use glitters, crystals... Super easy challenge, right? So come on, come play with us. 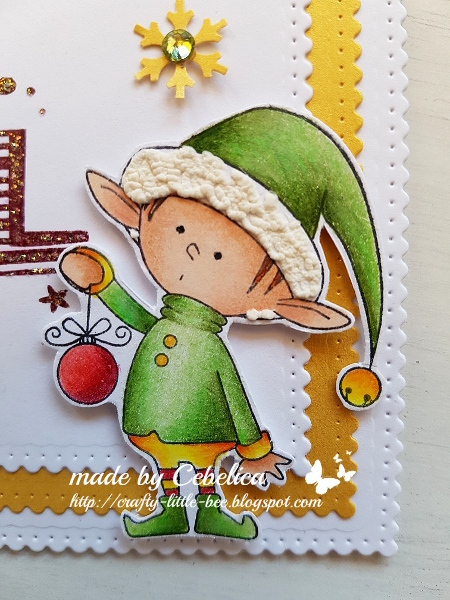 I made another CAS card for this challenge. Again I used one of the adorable elves from MFT and another sentiment stamp from Hobby Lobby. I did the colouring with pencils and Promarkers. On the white part of the hat I used some liquid applique. 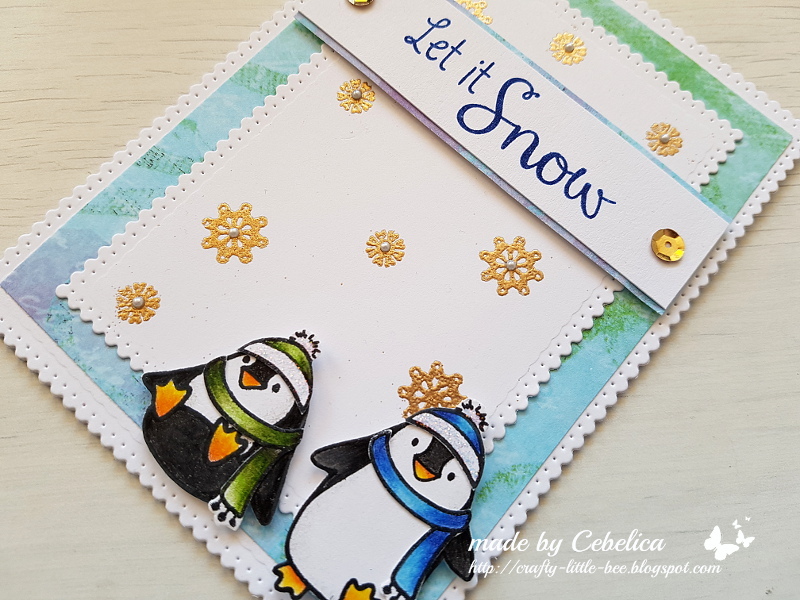 I covered the sentiment with diamond Stickles. 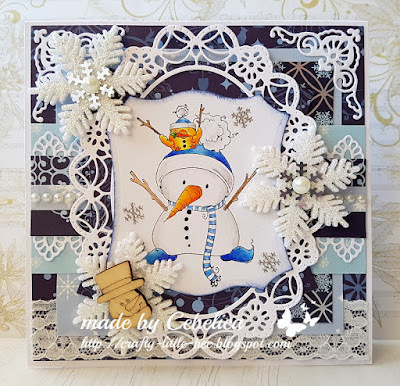 Snowflakes were made with my craft punch and I glued a small crystal in the center of every one of them.